In a blender or mini food processor, combine oil, vinegar, mustard, basil, and 1 tablespoon water; blend until smooth. Season with salt and pepper. If not using right away, transfer to an airtight container; refrigerate, up to overnight. 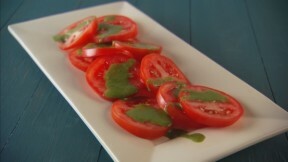 Slice tomatoes, and arrange on a serving plate; drizzle with dressing. Serve immediately.